Are you of age to responsibly enjoy Penny Blue Rum? To the West of Mauritius, nestled between the mountains and the azure sea, the Medine distillery has been producing rum since 1926. Located at the heart of our sugar plantation is the sugar cane press, distillery and ageing warehouse, ensuring every step of production takes place in the Estate. Each bottle is hand-dipped with our distinctive wax seal on the Estate as proof of our provenance. 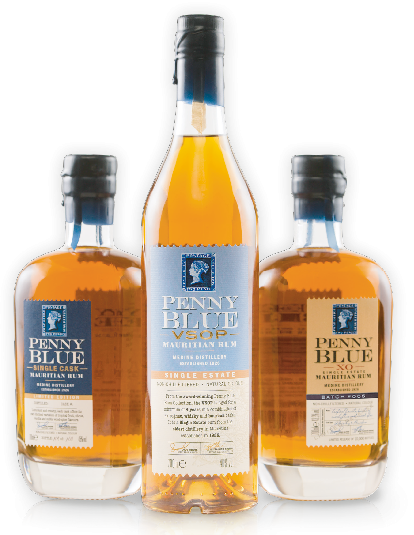 Penny Blue rums have often been described as whisky drinker’s rum. Released without a dosage of sugar, the naturally drier finish gives a more grown up and delicately complex character, and ensure the balance of the rum. Our multi award winning collection features a Pure Cane, VSOP, XO and Single Cask release, praised for their elegance and complexity. Mauritius - the idyllic, tropical paradise in the Indian Ocean -produces some of the world’s best sugar and distills exquisite rum. Sugarcanes first arrived with Dutch colonisation in 1638. So rum was made in the Indian Ocean long before it was taken to the Caribbean. At that time, sugarcane was grown exclusively to make sugar and the molasses were distilled into a spirit called arak or rum. For hundreds of years, only molasses were used for white rums. Today, sugarcane is still integral to the Mauritian landscape and rum production is more common, including some world class matured rum. At the centre of our own sugar cane fields, sits the Medine distillery, in operation since 1926. Find your bottle of Penny Blue Rum from one of the retailers listed on our Where To Buy page. To enjoy a taste of Mauritius wherever you are, try one of our cocktail recipe ideas.